A picturesque snorkelling site, the Aquario Natural has the clearest water in the world! After a 25 minute walk through a serene landscape, visitors reach the site which is home to beautiful colourful fish of several species along with rich underwater flora. Apart from snorkelling, visitors can also indulge in zip lining and swimming. While there, don’t forget to check out the Natural History Museum. It is recommended to visit the Aquario Natural between 8:00 am to 12:00 pm. How popular is Aquario Natural? 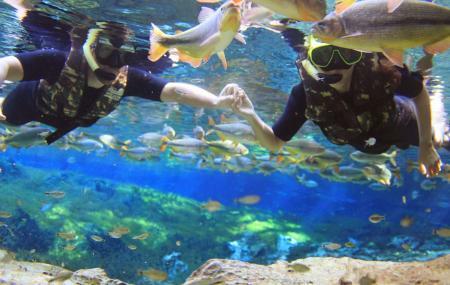 People normally club together Rio Da Prata and Rio Do Peixe while planning their visit to Aquario Natural. People also prefer to start their day with Aquario Natural. Over-priced, but a spectacular experience in the water. About 20 minutes ride by van or car from Bonito. Once there we got outfitted with a neoprene suit, mask and snorkel and walked a short way to the beginning of the river where a small lake has formed. One snorkel there for a while and can see where the water comes out of the ground and forms the river. Then we floated down the river. The water is very clear, almost invisible, and plenty of fish swimming with you. All together about 1:30 of snorkeling. Together with its proximity to Bonito this is a half-day trip.